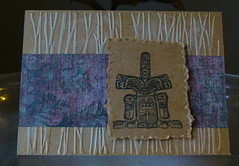 One of the vendors I always look forward to at the Calgary Art Market is the Old Island Stamp Company. I bought my first unmounted stamps from them about 3 years ago. I love their designs, and I also love that they are based in my very favourite part of the country, and somewhere I pine to go back to every time it snows here. I also bought a fern stamp. One of my favourite places to play where I grew up was in the stand of cedar trees at the top of our driveway – it was a perfect little den, and there were ferns along the bank too. The card above is just one layer, I stamped directly on to the base card. 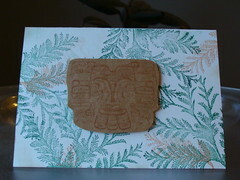 The woodgrain background was from the other stamp booth at the same craft fair, Local King Rubber Stamps. 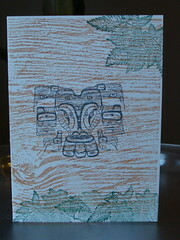 I used both cedar stamps on this card – the big one in ‘Evergreen’ ink (very appropriate!) and the small one in Tea Dye Distress Ink. That is just the colour dead cedar branches turn – I can almost smell them. I used my newest Cuttlebug embossing folder on the killer whale card at the top – I think it was called Twigs? I embossed some craft cardstock, then rubbed a pale inkpad over the embossing to bring it out. It’s a bit silly to put an orca on a twiggy and cedar-y card – I just bought some great wave-print paper though, so I’ll definitely be inking him up again. This entry was posted in Papercrafts by rycrafty. Bookmark the permalink. There are huge cedar forests around Fernie. There must be some other ones closer, but it seems to me Kananaskis is mostly pine and fir? Cute stamps!